I can’t believe my last post was at the start of the month. A lot has happened since then! See below or skip straight to the bottom for my fig, pear and ginger flapjacks recipe. Also, happy Diwali to everyone who celebrates! I had a great time going to three events at the Manchester Literature Festival. I’ve never been before, but there were quite a few interesting events on this year. I went to events for The Good Immigrant (a collection of essays about what it’s like to be a second-generation immigrant in Britain); an anthology of short stories inspired by Jane Eyre called Reader, I Married Him and edited by Tracy Chevalier; and an examination of writing about the Lancashire coastline, featuring Andrew Michael Hurley (The Loney) and Jenn Ashworth (Fell). They were all really inspiring and gave me a lot to think about as someone who would like to write a book one day! I also nabbed a free, signed copy of Jenni Murray’s A History Of Britain In 21 Women as part of a festival giveaway, which I’m rather chuffed about! Outside of the festival, I also went to see the wonderful Becky Chambers talk about her two books – The Long Way To A Small Angry Planet (READ IT NOW IT’S SO GOOD) and the newly released A Closed And Common Orbit (I’m waiting for the paperback to come out before I read it, but also READ IT NOW). She’s a really funny, intelligent woman, and it was a pleasure to hear her talk about video games, science and what it’s like to write a novel. I did, of course, watch GBBO to the end, and I’m not ashamed to admit that I cried a little at the end of the final (it’ll never be the same without Mary, Mel and Sue). I was originally rooting for Benjamina to win (that pina colada roulade… oof! ), but I’ve also loved Candice throughout, especially since That Pub, so I threw my support behind her when Benjamina left. I’m thrilled that she won in the face of a stupid amount of abuse on social media over her looks, as well as the fact that *gasp* she obviously wanted to do well in the competition – rather than being all British about it and pretending that it didn’t matter if she won or not. OF COURSE it matters when you take months out of your life to practice making ever more complicated baked goods in an effort to please Paul and Mary. Let’s not pretend that it doesn’t. I’m rather gutted that there’s no GBBO at all next year, but I’m hoping that the BBC will film Candice and Jane’s baking road trip and screen that instead next summer! As an aside, the final technical challenge was brilliant and exactly what a technical challenge should be (none of this ‘make something you’ve never heard of’ malarkey). The biggest low this month was being mugged on my way home from the Becky Chambers event earlier in the week. I wasn’t hurt, but was rather shaken up by having my bag snatched and being pushed over by two blokes bigger than me who could just jump out of and into a car and speed off. It’s made me quite anxious about leaving the house and getting home from work, especially as the nights are drawing in, but I’m hoping that I’ll get over it soon. I can’t very well stay indoors for the rest of my life! The thing I’m most angry about is that they took things that wouldn’t have had any value for them (although they did manage to squeeze £45 out of my bank card), but meant a lot to me. I also resent going through the long and expensive rigmarole of having the locks changed, replacing my phone and other things that were in my bag, notifying the relevant people, etc. All so some low-lifes can no doubt buy some cheap booze and fags before doing it again to another unsuspecting soul. I have also been baking this month, so don’t worry! Unfortunately, all of the photos were on my stolen phone, so I’ve only got some snaps from Instagram to share. This was a really easy cake to make. I settled on this after my husband requested something lemony for my next bake.The sponge was wonderfully light and soft, with plenty of flavour. 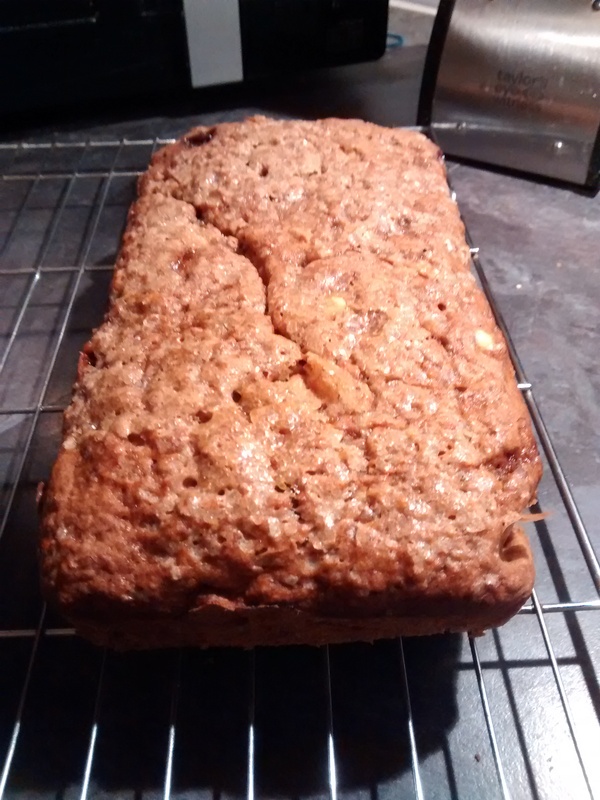 I deviated a little from Mary’s recipe and put the zest of two lemons instead of just one into the mix – it really made a difference to the flavour, I think. The recipe is on Mary Berry’s website. 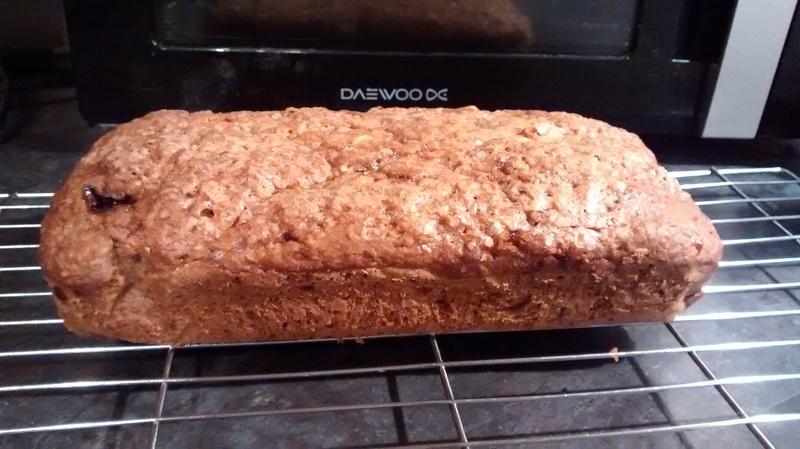 This is pretty the same as the banana, rum and raisin loaf I’ve made before, except that I made a rum drizzle (50g icing sugar mixed with 2-3 tbsp of dark rum) to pour over the top of the warm cake. This seemed to make the cake exceptionally boozy, which I’m sure Mary Berry would approve of! 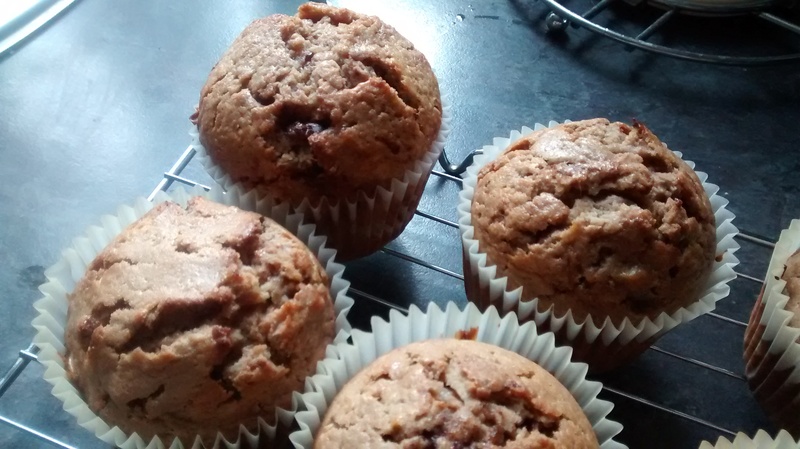 Last week I really wanted to bake something, but couldn’t be bothered going to buy particular ingredients, so I made do with what I had in – dried figs, a pear from my mother-in-law’s garden and my trusty store cupboard. I pretty much just jazzed up a basic flapjack recipe, with good results! The flapjacks were wonderfully autumnal, if not a little soft due to the fruit – but still very nice if you don’t mind bits of flapjack falling everywhere! The recipe is below. Toss the diced pear in a little lemon juice and sugar, and set aside. In a saucepan, melt together the butter, sugar, syrup, ground ginger and cloves, stirring frequently. Remove the pan from the heat and stir in the oats, figs, drained pear pieces and stem ginger. Press the mixture into the tin and bake for 40 minutes, or until golden. It may still be soft in the middle at this point, but it should firm up as it cools. Cool completely in the tin, then turn out and slice into 16 squares. Here’s to a more normal November! Another week, another Sri Lankan feast! This time, my husband cooked lots of rice and curry for our friends, and I made a dessert that we had a fair bit of when we were on honeymoon – watalappan, a set custard made with jaggery, coconut milk and lots of spices. This is a great dinner party recipe, as it can be made in advance and left in the fridge until required. I used this recipe by Peter Kuruvita, who has also written a brilliant Sri Lankan cookbook that we use and that apparently is considered something of a bible by chefs in Sri Lanka! I followed the recipe exactly, but I served it with toasted fresh coconut, in-season Indian mango and sliced Keralan bananas, which were the closest thing we could find to the bananas we ate a lot of in Sri Lanka. I also drizzled the plate with golden syrup as recommended by Kuruvita as a substitute for palm syrup. The only tricky thing was baking the custards – they seemed to take longer than stated, but I reckon that’s just my oven rather than the recipe being at fault. They did eventually cook after I turned the heat up slightly. 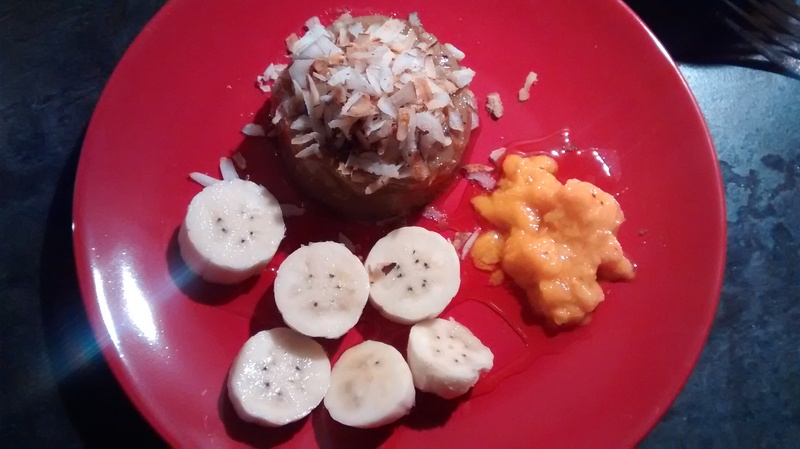 The resulting dessert was rather wonderful – the sweet, spiced coconut custard combined with juicy mango and flavoursome bananas offered a perfect balance of flavours. It’s a great recipe to use if you’re planning a Sri Lankan or Indian feast and want an easy dessert that will impress! As promised, I’ve had a go at making one of the desserts we had in Sri Lanka. 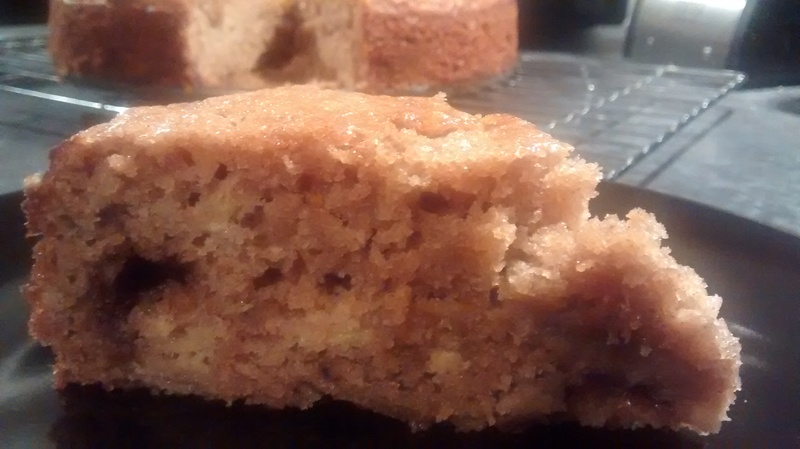 My husband cooked a wonderful Sri Lankan rice and curry feast for his family the other week, so I decided to make banana and cumin cake to serve as the dessert. 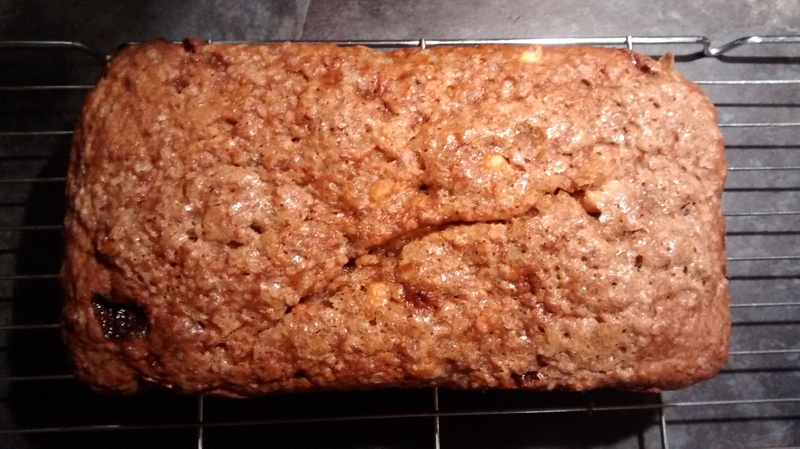 I couldn’t find any recipes for this online, so I adapted a banana and walnut loaf recipe from my Delia book, swapping out the walnuts for cashews and adding more in the way of spices. The main sticking point was the question of how much cumin to use. The cake we had in Sri Lanka offered up a burst of cumin with the occasional bite, so it wasn’t packed with the stuff, but I didn’t want to under-spice it, either. I decided to use a teaspoon of cumin seeds, but as it turned out, I should have followed my husband’s advice and used more! I only got a hint of cumin when I tasted the cake, which was slightly disappointing, but the cake was delicious anyway and at least I know for next time! Pre-heat the oven to 180C/gas mark 4. Grease and line a 2lb loaf tin. Whisk in the butter, egg, sugar and jaggery until you get a sandy texture, almost like large crumbs. Mash the bananas in another bowl and whisk them into the flour mixture, along with the ground cloves, ginger and cardamom. Fold in the lemon zest, cumin seeds and cashews. Transfer the mix to the loaf tin, level the top and sprinkle the demerara sugar over the top. Bake in the middle of the oven for 1 hour and 10 minutes, or until a skewer inserted into the middle comes out clean. 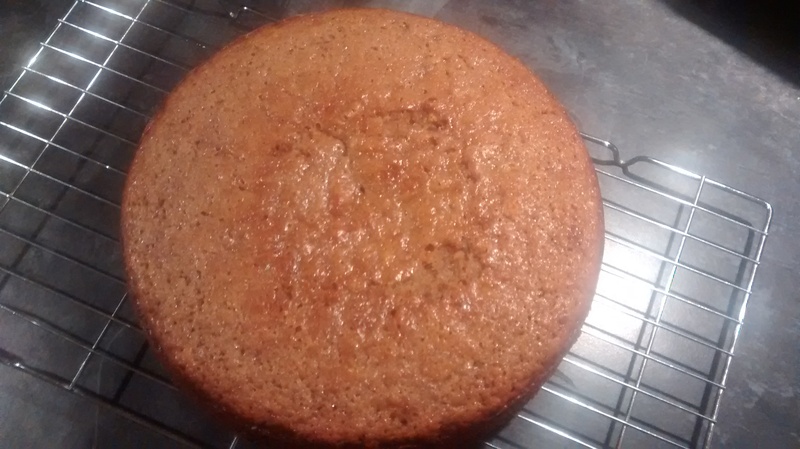 Let the cake cool in the tin for 10 minutes before turning it out onto a wire rack to cool completely. Serve on its own or warm with ice cream. 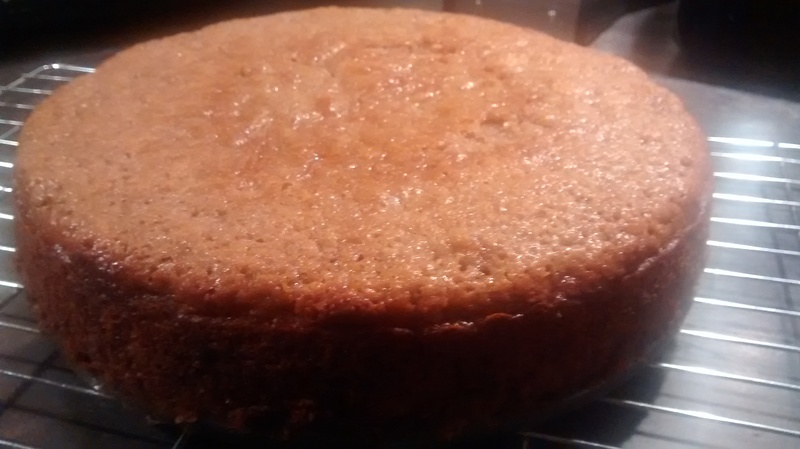 I wonder if there’s anything else you should do with overripe bananas other than put them in a cake? There probably is, but baking a cake is always going to be my first choice. I ended up making this banana and chocolate spice cake after ending up with three very ripe bananas earlier in the week, and it’s so good! The recipe is from Scandilicious Baking by Signe Johansen, which I picked up for mere pennies in a sale a couple of months ago. This is the first recipe I’ve tried from the book, and it went like a dream. The cake is basically your typical banana cake with spices such as cinnamon, cloves and cardamom. The recipe says you can also add a handful of chopped nuts, but I opted for some chopped milk chocolate instead. I also substituted the creme fraiche with soured cream, as that was all I had in (and I know from experience that soured cream is a truly magical cake ingredient! 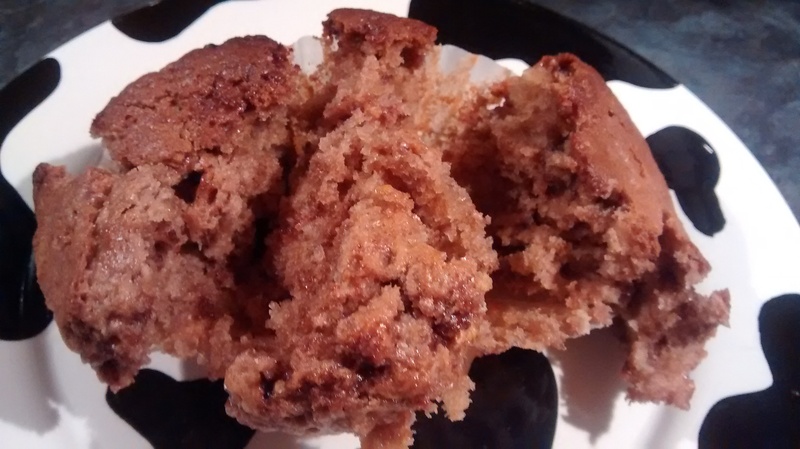 ), as well as swapping the light muscovado sugar for light brown sugar. I had to leave the cake in the oven for close to an hour rather than 45 minutes as called for in the recipe, but it was perfectly baked when it did come out. Believe me when I say that this is a truly scrumptious cake. The spices and banana go together perfectly (especially the cardamom) and the pockets of chocolate take the cake to the next level. I’ve mostly been having this cold, but last night I tried it warm with ice cream and that was delicious too! I do have one (nice) problem though: it’s such a big cake that I’m struggling to get through it all by myself. I would recommend baking this when you have a crowd to feed! For someone who loves bananas, I always seem to have at least one lying around in a state of over-ripeness. 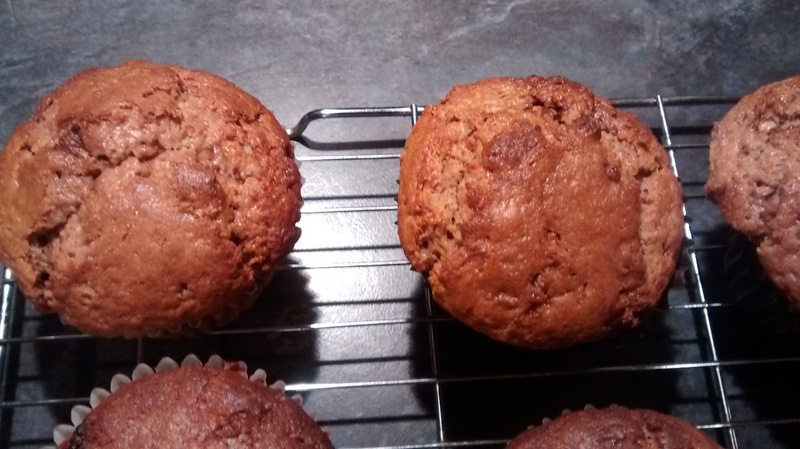 There aren’t many baking recipes that call for just one banana, but I did find one in the form of an old WeightWatchers recipe for banana and Maltesers muffins. Now, it’s been a long while since I last counted ProPoints to the point of obsession, so I had no compunction whatsoever in fattening up the recipe and swapping Maltesers (which I like) for Nutella (which I bloody love). 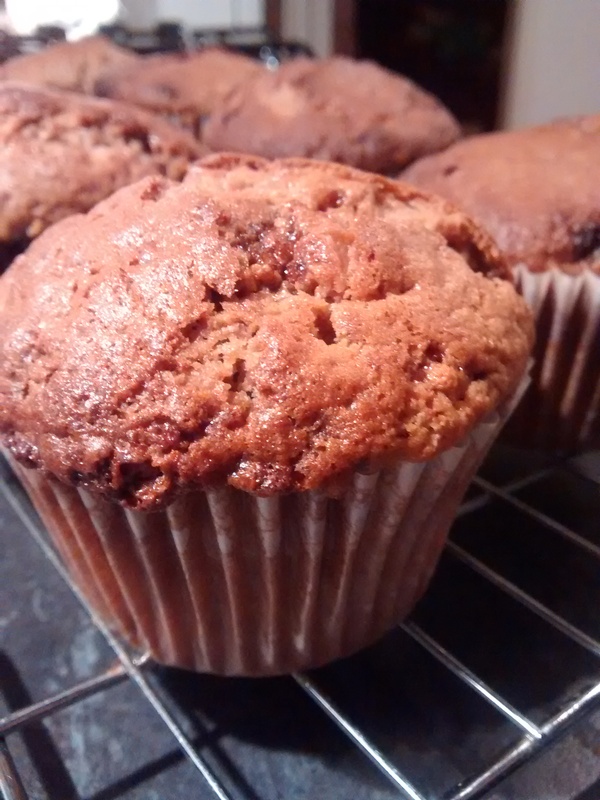 The end result was these very lovely muffins. They were very easy to make – the key, as always, was in stirring the mix just the right amount so it wasn’t quite combined. A few seconds more and they probably would have ended up extremely rubbery. 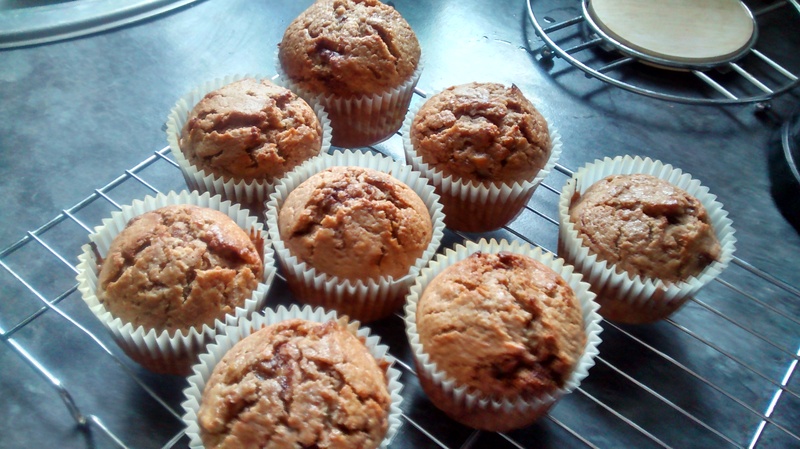 Just to warn you, the recipe only makes 8 medium-ish muffins – you could make 4 massive ones or 16 mini ones if you wanted. 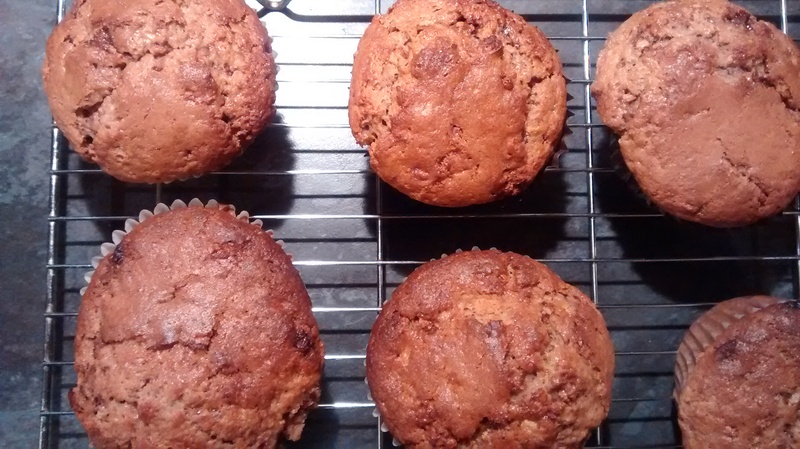 The muffins tasted exceedingly nice – the banana was pleasantly strong, with the Nutella adding a lovely, decadent sweetness. 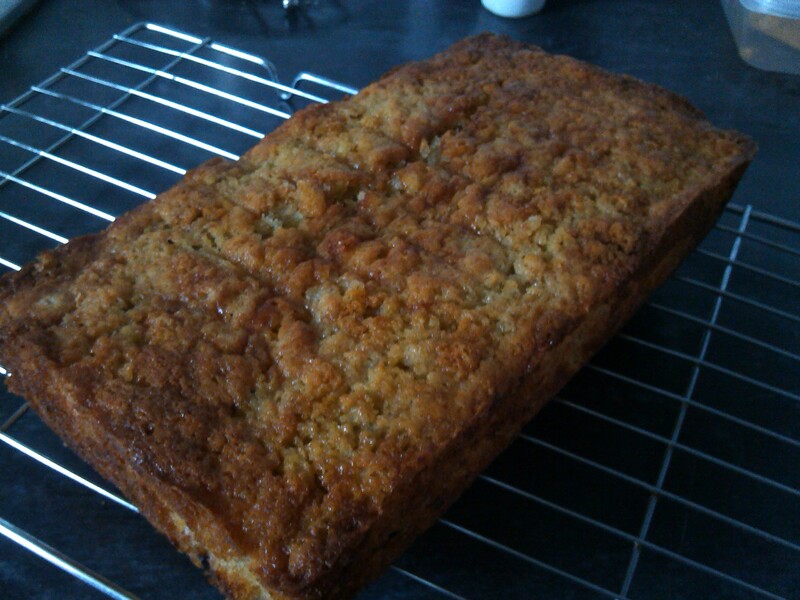 For an experiment with a low-fat recipe, it all turned out rather well! Preheat the oven to gas 6/200C/180 C fan and line 8 holes of a muffin tin with paper cases or squares of baking paper. Add the egg mixture, banana and Nutella to the flour mixture and stir until only just combined (you should still see streaks of flour in the mix). Spoon the mix into the muffin tin and bake for 20-25 minutes until risen golden, before cooling. 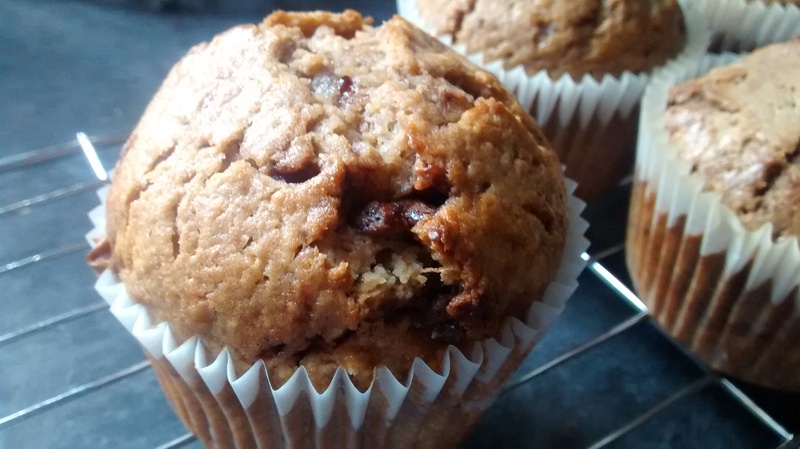 There have have been a few more bananas going uneaten and therefore in a perfectly ripe state for baking with at work recently, so I took it upon myself to take some home and turn them into a piece of baked deliciousness a couple of weeks ago. 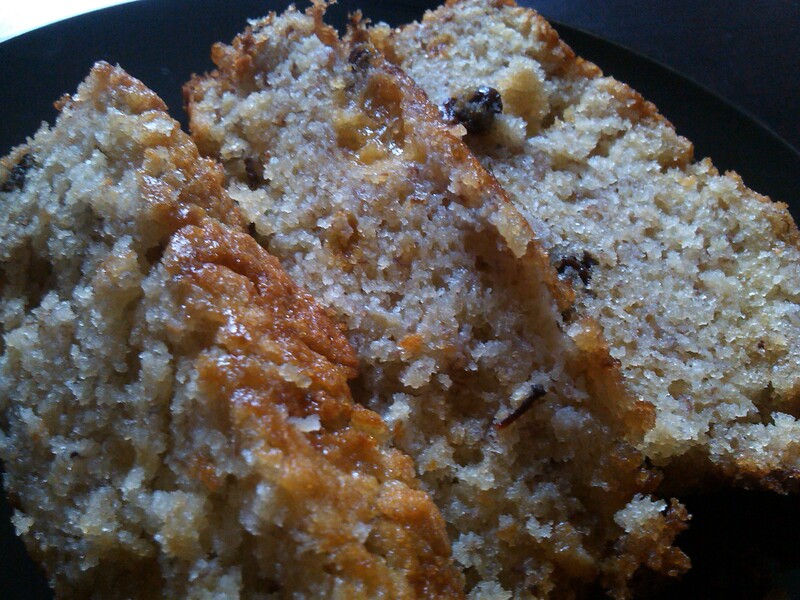 The result was this rather sumptuous banana, rum and raisin loaf, which I sort of invented from this recipe. Generally, it’s ideal to soak dried fruit overnight to make sure they properly soak up the flavours of the liquid. However, I only had time to soak the raisins in the rum for about half an hour! I don’t do very well at following soaking instructions (remember my rum and raisin biscuits?) but I usually manage to wing it as I can still taste the booze! The rest of the loaf was very easy to make. I added a splash of rum to the mix (as I had some rum left over from soaking the raisins) but I’m not sure how much of a difference this made! 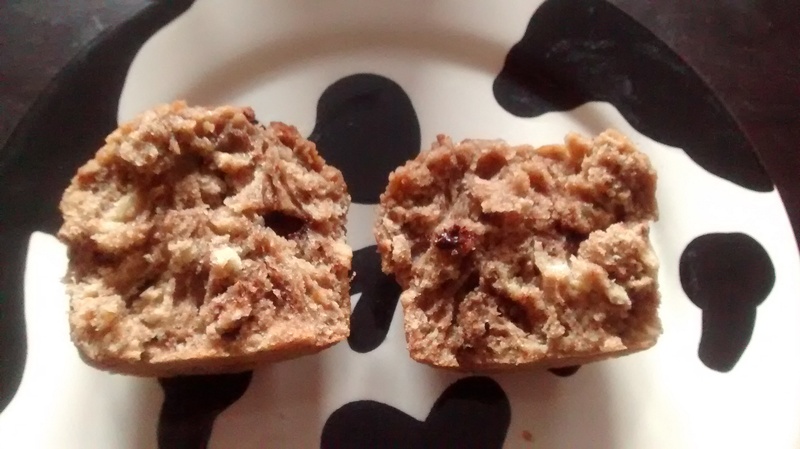 However, the resulting loaf was lovely – soft, fruity and very definitely tasting of rum. 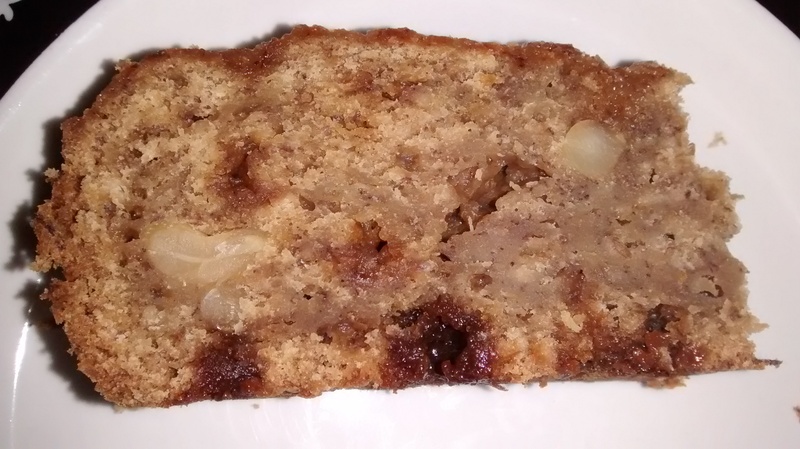 I would recommend this recipe if you have bananas to use up but would like to make something a little more grown-up than standard banana bread. The great thing is I couldn’t very well tip the leftover rum back into the bottle, so I mixed it with some ginger beer and lime juice for a refreshing drink. Waste not, want not! Soak the raisins in the rum in a covered bowl for at least 30 minutes, preferably overnight. Drain and reserve the rum. Heat the oven to 180C/160C fan/gas 4. Butter and line the base and sides of a 2lb loaf tin. Cream the butter and sugar until light and fluffy, adding a splash of leftover rum if you want, then slowly add the eggs with a little flour. 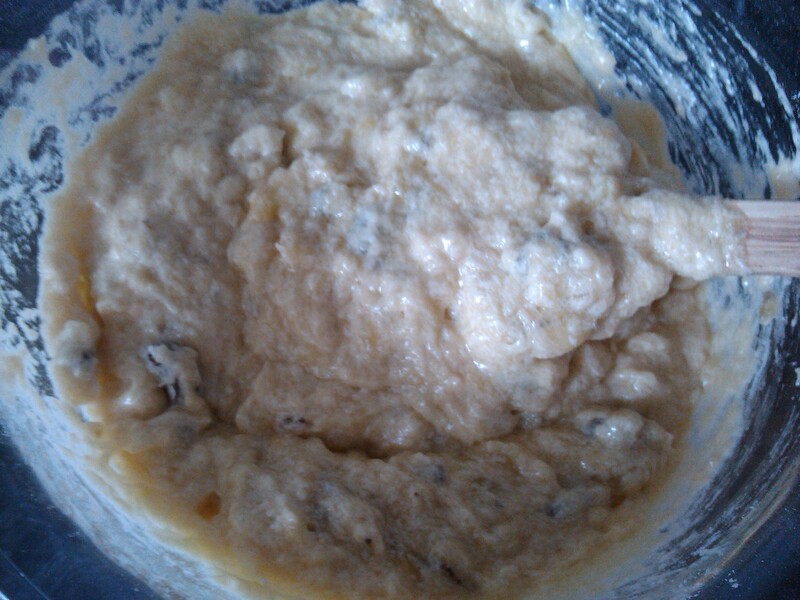 Fold in the remaining flour, raisins, baking powder and bananas. Pour into the tin and bake for about 30 mins until a skewer comes out clean. Mix yourself a nice drink with the leftover rum while you wait. Cool the loaf in the tin for 10 mins, then turn out on to a wire rack to cool completely.